Several years ago, I traveled to Budapest, Hungary with a friend. While we were there, some locals strongly recommended a particular bar. It was in the basement of a stately building in an old and beautiful part of the city alongside the Danube River. We went down the stairs with great expectation, opened the door and were hit with a cacophony of bright colors and cheesy images. There were saguaros, scorpions, rattlesnakes, tarantulas and sombreros. Our friends had recommended this spot because, knowing we were from Arizona, they thought we’d feel at home. We did not have the heart to tell them that the level of kitsch was almost painful to us Arizonans, so we lied and told them it was fabulous. We had a wonderful time with lovely people and, as the hours passed, the décor became less and less noticeable. This event has always stood out in my mind as a true example of how the image of the desert southwest has been made almost cartoonish over time. In reality, we live in a complex ecosystem with deep layers of subtlety that is far more interesting than the stereotypes. Our environment may seem rugged, but it is extremely delicate and needs careful caretaking. The more you know, the more you appreciate it. All the ubiquitous symbols of the desert that were on display in that bar have incredibly interesting sides to them that are not well known. The Saguaro cactus (Carnegia gigantea) is the perfect example of a misunderstood icon. Most people connect it immediately to the American West and even more to the Wild West. 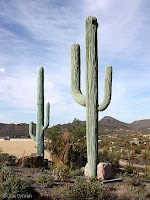 However, saguaros are only found in the Sonoran Desert, which includes southern Arizona, southeastern California, Baja California and the Mexican state of Sonora. Tucson is the epicenter of saguaro habitat; we even have two National Parks dedicated to them that book-end our city. Saguaros are very slow-growing (at 10 years it may only be 1-1½ inches tall), but can live to be 150-200 years old. They don’t even flower until they are around 70 years of age, at which time they are about 6½ feet tall. 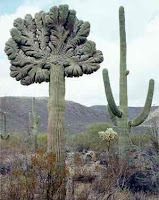 Their famous arms finally begin to appear when the cactus is 95-100 years old (when they will be between 15-16 ft tall). So, the famous shape of a multi-armed saguaro depicts an old desert soul that has been around far longer than the humans it shares a habitat with. As with other desert dwellers, the saguaro thrives in the desert due to its ability to maximize available water. They store water when it is available and use it as needed. When full of water, a full-grown saguaro can weigh as much as 3200-4800 pounds. 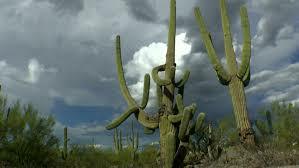 But saguaros don’t only care for themselves; they support multiple species within their thorns and around their roots. Brenda Z. Guiberson wrote a fabulous children’s book (with also-fabulous illustrations by Megan Lloyd) about the multi-tasking saguaro called Cactus Hotel. It is great fun for adults and kids and has long been a favorite in my family. As interesting as saguaros are, their mutant relations, known as Crested (or Cristate) Saguaros, are even more fascinating. These rare cacti grow outward and form fan shapes at their tops instead of the normal circular pattern of a saguaro. The cause of this mutation is still a mystery; theories include lightning strikes, gene mutations and frost damage. The interest in and love for these unique cacti have even sparked the Crested Saguaro Society, who are dedicated to “these beautiful mutants”. Yep! Those Are Cell Towers. Saguaros are incredibly hardy plants; they are not prone to disease and have adapted to thrive in one of the most extreme environments in North America. Additionally, although they are only found in a limited range geographically and grow incredibly slowly, they are not endangered. The greatest danger to saguaros, like most of the species on Earth, is humans. Unchecked development, over-popularization of the species and the introduction of non-native species all threaten our saguaros. Thankfully, they are strictly protected by law in Arizona and it is illegal to own, remove or transport the protected plants without proper permits. Likewise, harming a saguaro in any way carries strict penalties. Southern Arizona saguaros are seen as a natural treasure by most of us who live here. Their limitless variations and enduring beauty are a source of endless marvel. We like them so much that we even have cell towers shaped like saguaros. 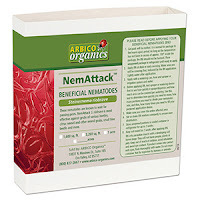 ARBICO is excited to announce the launch of our newest species of beneficial nematodes – Steinernema riobrave! Compatible with other varieties of nematodes, S. riobrave has shown fantastic results in controlling white grubs, citrus weevil, plum curculio and other hard to treat pest insects affecting the citrus and turf industries. They are also useful for controlling pests in apiaries, home gardens and monocultured areas where crop- or species-specific pests are present. Is It The Right Species For You? 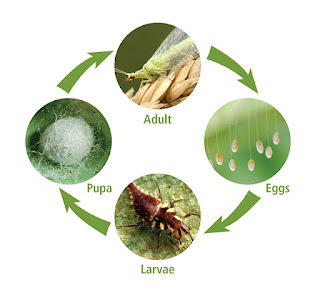 If you are treating for any of the listed pests, S. riobrave will help you in that task. Similar to our four other nematode species, S. riobrave nematodes attack the immature, soil-dwelling stages of their target pests. For that reason, they need to be sprayed into the soil for most applications. Timing applications properly is still important to maximize infection rates and prevent damage to the crops being treated. We encourage you to call us if you are unsure about the best time to apply nematodes for a particular pest or have questions about the nematodes themselves. Beneficial nematodes work best when integrated with other pest management approaches, so don’t neglect the simple stuff. Whether it is trapping, knockdown sprays, proper monitoring, etc. our team of biocontrol specialists is happy to discuss the best ways to achieve control in your area. Contact us by phone or send your pest control questions to drbuglady@arbico.com and we will get back to you as soon as possible. 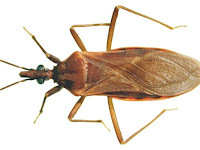 One of the least popular insects that appear in our desert over the summer months is the Kissing Bug (Triatominae, subfamily of Reduviidae), also known as conenose bugs, vampire bugs or Mexican bed bugs. The variety of names reflects the fact that there are many (up to 85) species in the Americas, with about 15 in the United States. As temperatures have warmed across the continent, kissing bugs have been able expand and thrive in new areas. These 6-legged, winged insects vary in color from a light brown to black and have red, yellow or tan markings along their abdomens. They are small (about ½-1” long) and rather flat (unless they’ve recently fed) with an elongated oval shape. They can be easily mistaken for assassin, wheel or stink bugs (and even cockroaches). And now for the gory stuff: Kissing bugs feed on mammalian blood through all five stages of development, from nymphs through adults. Females lay eggs between June and September and their offspring hatch out and begin seeking blood in 1-3 weeks. Although they can go long periods without feeding, these bugs feed more regularly when hosts are readily available. A single feeding can last a disturbing amount of time: 20-30 minutes. Their preferred hosts include dogs, opossums, coyotes, mice, skunks, raccoons and humans. 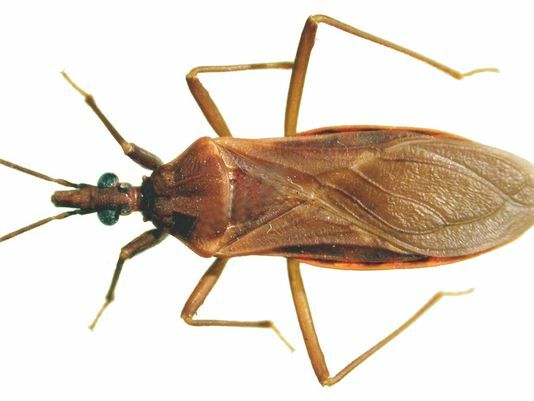 Kissing bugs get their name from their proclivity for biting people on the face, especially around the eyes and lips. They are able to get so close without being detected because they are nocturnal and seek out sleeping prey. They then inject an anesthetizing agent before they draw blood, so the sleeper is usually not even aware of the bite when it happens. They will wake up with unexplained marks or welts on their skin. Although kissing bugs are undoubtedly blood-suckers, researchers have found that they also feed on plants. They source sugars and proteins from plants and this seems to keep them healthier and more energetic so that they can bite more people. 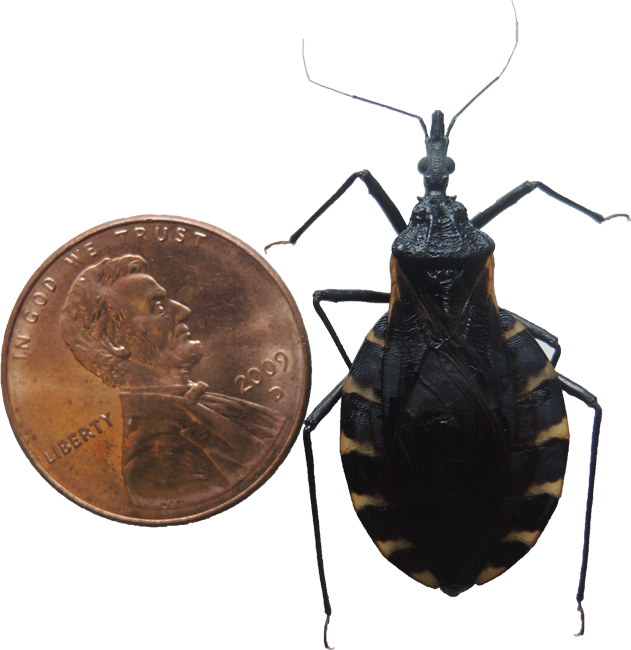 Kissing bugs pose a danger to people because they can carry the parasite Trypanosoma cruzi, which causes Chagas disease. This serious disease is found all over Mexico, Central and South America. As many as 21,000 deaths a year are attributed to Chagas disease in these regions. While there have been some cases in the United States, it is, thankfully, rare here. This is due to the type of species we have here. Chagas is spread through the bug’s feces. They defecate while feeding and when a person wakes up and scratches at the bite, he/she introduces the infected poo into their body. Kissing bugs in Arizona don’t exhibit the type of behavior that spreads the disease; they don’t defecate where they feed. Clean up wood, rock piles and animal nesting areas in the yard and move items they can hide in away from the house. If you dry clothes on the line, bring them in as soon as they are dry. Keep your pets indoors, especially at night. In Arizona, pack rats and their nests are favorite lodging places for kissing bugs. While pack rats are difficult to control on their own, ridding yourself of them will also lessen your chances of having kissing bug problems. To get rid of the kissing bugs in your yard, try a combination of granules as a barrier and a spray insecticide to cover the area. Essentria™ G Granular Insecticide and EcoPCO® AR-X Multi-Purpose Insecticide would be good choice. Ah, summer in Arizona: ridiculously hot days, wild monsoon storms, terrifying haboobs, exquisite sunsets and all sorts of critters out wandering around. It is not a time for the faint-of-heart. But, for us true desert creatures, this is the best time of year. The primordial joy of rain after extended months of dryness is shared by flora, fauna, humans and insects alike. What we call monsoon season runs from late June through September. Our storms are caused by a seasonal shift in winds that draws moisture-rich air from the Pacific Ocean and Gulf of Mexico up into Arizona. This air hits the super-hot air in the valleys and shoots up the mountains into the atmosphere. Once there, it builds and builds until it rolls back down as an action-packed storm. Watching the storms build is a favorite pastime of all us Arizonans, but the changes they bring to desert are life-affirming. Desert dwellers, of all species, can sense and smell the rain as it’s coming. This earthy smell of rain as it lands on dry soil is called petrichor. In Tucson, where I live, we also recognize the beguiling scent of the creosote bush. Monsoon rains provide almost everything in the ecosystem with renewed life. Plants green up and fruit ripens, providing food for mammals, birds and insects. All this additional fodder makes this the ideal time for mating, so the parade of mating creatures comes out during monsoons. Arizona is ranked 3rd in the country for biodiversity by The Nature’s Conservancy and, at times, it seems like they are all out after a good, hard rain. Lizards, snakes, beetles, arachnids, toads and mammals come to feed and mate. This is the only time to see our most publicity-shy desert dwellers, as they stay hidden the rest of the year. 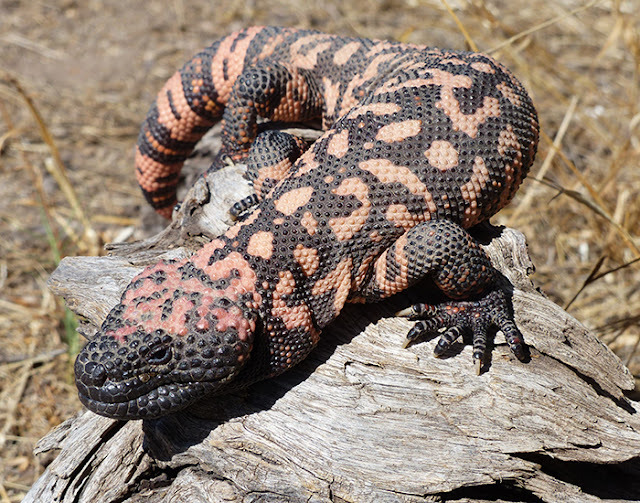 At the top of the list of spectacular monsoon creatures is the Gila Monster (Heloderma suspectum). These lumbering beasts are the largest lizards in North America and can grow up to 2 feet long. 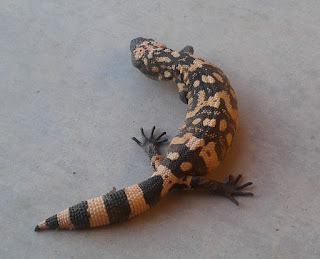 They are one of only two venomous lizards in North America and the other, the Mexican beaded lizard, is a close relative. Gila Monsters spend 90% of their time in underground burrows and only emerge after rains to drink, bathe and mate. It is during this search for a partner, when their biological impulses outweigh their natural reticence, that people run into them. This year has been an active one for Gila Monster sightings - we had one crawling across our office parking lot one day, a co-worker had two loudly mating in her driveway and my Facebook feed has been full of pictures of Gila Monsters in garages, on porches and by swimming pools. I recently had a knee injury and was ordered to stay off it for a couple of weeks. During my forced vacation, I spent most of my time on the living room couch. From that vantage point, I could watch the dogs going about their business in the backyard. One evening I noticed that Bob, our large Shar-Pei/Lab mix, was acting strangely. He was dancing around, jumping and pawing at something on the ground. He looked exactly like a fox hunting for mice under the snow. You could almost see the thought bubbles over his head saying, “What the heck is that monstrosity?”. Bob is generally a dignified and somber older gentleman and this behavior was decidedly unusual for him. So, ignoring the admonishments of my family to stay put, I hopped over to the door to see what had poor old Bob so upset. 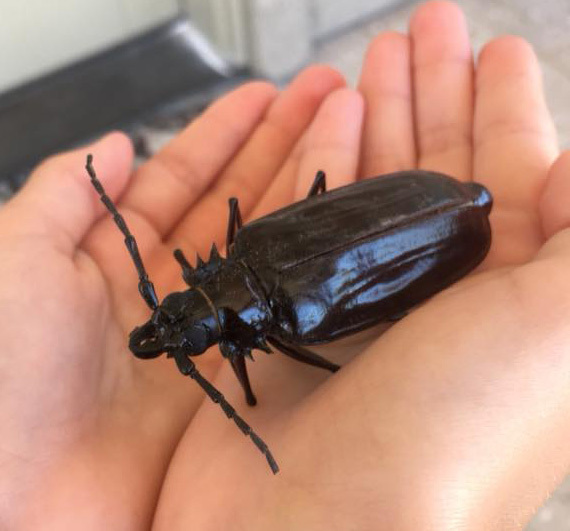 What I saw made me laugh – Bob had come across a particularly large Palo Verde Beetle. I have seen large humans freak out when they see these bugs, so it was perfectly acceptable to me that our dog would go bananas over it. As I stood there laughing, Bob took one more manly leap and crushed the beetle, then quickly ate it. What had been funny was suddenly just gross.